Father Adam Gaunt, Rector of St Leonard’s Parish Church Loftus, and Father Stephen Maughan, Parish Priest of SS Joseph & Cuthbert Catholic Church Loftus, joined together on Saturday 19 May 2012 to resurrect the Loftus May Procession as an Ecumenical event. Bishop Martin Warner Bishop of Whitby and Bishop-Elect of Chichester was the guest preacher at St Leonard’s and Mgr Gerry Dasey the Vicar General of the Diocese of Middlesbrough was the guest preacher at SS Joseph & Cuthbert. 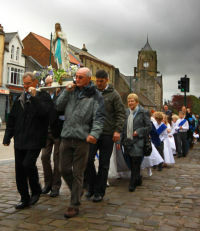 The rain stopped half an hour before the procession was due to begin enabling a walk of witness from the Anglican parish church to the Catholic church through Loftus Market Place. There was a great turn out of over 150 local people and it was superb to see so many children from St Joseph’s RC Primary School in Loftus joining in many of whom were wearing their first Holy Communion outfits and blue sashes. At the end of the festival the Bishop of Whitby and the Vicar General blessed the newly restored Grotto of Our Lady of Lourdes in the grounds of SS Joseph & Cuthbert’s church. This was another example of the warm relationship which is continuing to grow between the two churches in Loftus; following on from the Ecumenical Prayers for the Dead in St Leonard’s Churchyard in November 2011 and the Ecumenical Civic Christmas Carol Service in SS Joseph and Cuthbert’s December 2011. The people of St Leonard’s and SS Joseph and Cuthbert’s Loftus are now looking forward to their joint Ecumenical Flower Festival to celebrate Queen Elizabeth’s Diamond Jubilee as well as the Parade and Ecumenical Service of Thanksgiving on Saturday 2nd June 2012.